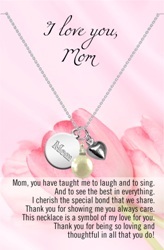 I Love You Mom Necklace with pewter charms comes with the following poem: "Mom, you have taught me to laugh and to sing And to see the best in everything. I cherish the special bond that we share. Thank you for showing me you always care. This necklace is a symbol of my love for you. Thank you for being so loving and thoughtful in all that you do!"